A world-renowned transportation services company approached us to rethink the way people rent trucks online to increase customer satisfaction and at the same time generate more rentals. Once we started to understand truck renter's needs I started sketching possible workflows for testing: a traditional method similar to other current workflows where the user selects dates and pickup/drop-off locations first, another one where the truck is selected first, a more conversational workflow and a simplified version where all the selections would be made on one single scrolling page. After these 4 concepts were refined I created interactive wireframes for each of the workflows for testing. To understand customers mindset and needs we conducted two rounds of remote interviews with a total of 22 renters that had made a truck reservation within the last month for both personal or commercial purposes. We also conducted in person interviews with commercial customers. The participants reviewed current truck rental processes, went through different wireframe workflows and were asked various questions about renting moving trucks. 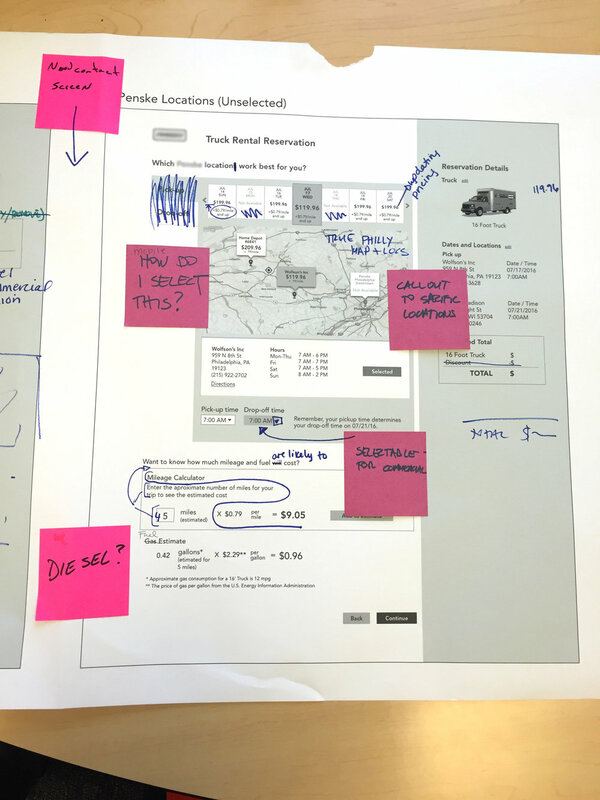 With these new findings we annotated our wireframes with updates for the next round of testing. Once we were done with the interviews and updated the wireframes we had a working session with the client to align customers and business needs. We then narrowed down to one workflow for personal and one for commercial customers. Once we were done with the interviews and updated the wireframes we had a working session with the client to align customers and business needs. We then narrowed down to one workflow for personal and one for commercial customers. Based on the research it became evident that customers wanted to be able to make reservations on their phones so the client asked us to design this workflow so they could share with developers for final implementation. As part of the final client deliverables I created a poster highlighting how the new workflow compared to the current state by requiring less steps, consolidating screens and reorganizing tasks for a more efficient process. A few years later an MVP was released with most of the features that we designed, tested and validated.